1 From the beginning of time, men have built forts and other strongholds on the tops of hills. From that position they could see anyone who approached. Attacking a hill fort was more difficult for an enemy. 2 Over time, it wasn't just military strongholds but centers of government that were placed in that position. After all, those who serve in government enjoy being looked up to in reality and figuratively. This was true in Canada as it is in other countries. 3 The site for Canada's parliament buildings was chosen before Confederation. The buildings were designed at first to house the government of Canada's East and West (now Quebec and Ontario). 4 The buildings sit on Barracks Hill overlooking the Ottawa River. The Rideau Canal borders it on the east. They were still being constructed when Confederation was begun in 1867. 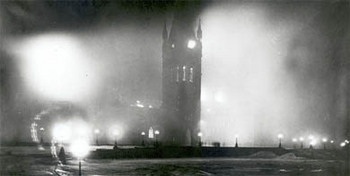 5 The West Block was constructed in 1865. The first part of the East Block was built in 1867. The second part was finished in 1910. The Library of Parliament and the Center Block were finished in 1876 and 1878.